The No. 7 women’s and No. 12 men’s cross country teams travelled to Oshkosh, Wis. and placed seventh and eighth in the nation, respectively. Photo Courtesy of Sports Information. On Nov. 17, men’s and women’s cross country headed to Oshkosh, Wis. for the 2018 NCAA Cross Country Championships. 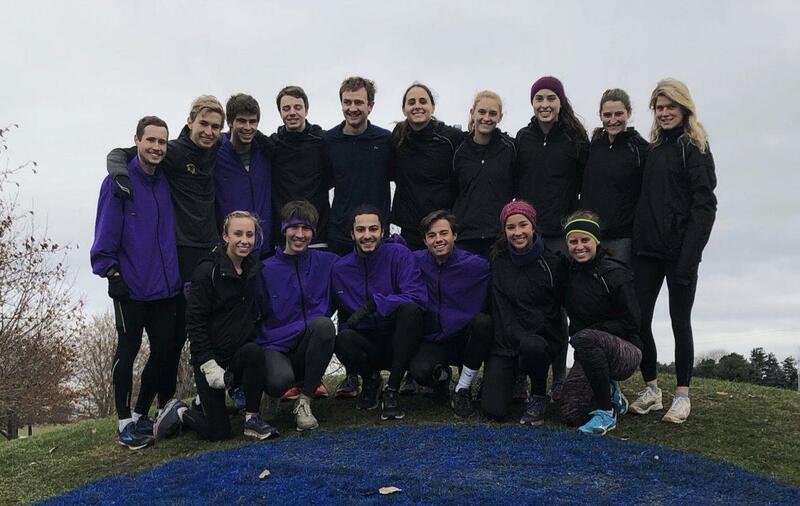 The women placed seventh while the men placed eighth. In the women’s race, Washington University won the meet with 98 points. They were closely followed by Johns Hopkins in second with 99 points. The women finished in seventh with 283 points, beating rival and NESCAC champion Middlebury, who placed eighth with 301 points. Paige Lawler from Washington University won the 6k race in a time of 20:55. Emma Herrmann ’20 was the first Eph to finish, with a time of 22:06, taking 46th place. She was six spots away from becoming an All-American. Co-captain Emily Harris ’19 placed 58th with a time of 22:15, and Audrey Rustad ’20 followed just behind in 61st with a time of 22:16. Sarah Tully ’21 was the next Eph to meet her teammates at the finish line, running a time of 22:37 for 108th place. Grace Dailey ’22 followed behind soon after and ran 22:39 for 114th place. Head coach Pete Farwell ’73 highlighted Dailey’s performance, noting that she “truly dug deep to kick it in down the stretch.” Jaylan Fraser-Mines ’21 finished about one minute after Tully and Dailey, running 23:34 for 226th place. Co-captain Lindsay Klickstein ’19 finished right behind Fraser-Mines for 240th, running a time of 23:40. The Ephs again showed their depth as the difference between runners one and five was a mere 30 seconds, indicating how close the pack was. Farwell noted that there was “great racing in a dense field [with] everyone moving up and super finishing over the final kilometer, picking up several team places.” He was also quite excited about the Ephs’ finish: “This completed an excellent team season, beyond expectations,” he said. Harris recapped her last season. “We’ve accomplished what we have as a team this year because we’ve been able to work extensively with each other in practice and on the course during the race — which, in my 11 years of competing on cross country teams, is something that has been really unique to this year,” she said. The men came off of six straight second-place performances, beginning at Little Three Championships on Sept. 8 and culminating in the New England Regionals on Nov. 10. Ranked second in the region and 12th nationally, the men were joined by five other New England teams: No. 8 Amherst, No. 18 Middlebury, No. 19 MIT, No. 27 Tufts and No. 29 Bates. Last year at NCAAs, the men finished 13th as a team. Only two Ephs from last year’s squad competed at the 2018 NCAA Championships: Ryan Cox ’20 and Aidan Ryan ’21. The two have been a formidable one-two punch for Williams this season. Cox has been among the best in the region this year, with Ryan either in lockstep or a stride behind. Cox won the NESCAC Championship this year, the first Eph to do so since Colin Cotton in 2014; Cotton finished second in the nation that year. Joining Cox and Ryan was a talented group: William McGovern ’20, Sam Wischnewsky ’20, Tristan Colaizzi ’20, Kevin LaFleche ’20 and Elias Lindgren ’22. McGovern has been Williams’ third man in every 8k this year, and got stronger as the season progressed. Colaizzi and LaFleche, All-Americans on the track in the 1500 and 800, respectively, have proven this season that they can compete on the grass as well. Colaizzi has been in Williams’ scoring five in both the NESCAC and Regional Championships. LaFleche, meanwhile, has either been in Williams’ varsity seven or eight man at every 8k this season. Lindgren has been a diamond in the rough for the Ephs, announcing himself with a fifth place finish at the Little Three Championship to start the year. Although only a freshman, Lindgren races with a patience and intelligence beyond his years. The men battled it out on the race course and placed eighth overall with a total of 300 points. North Central (Ill.) placed first with 43 points, Washington University came in second with 110 points and Wis.-La Crosse placed third with 127 points. The men graduate Lucas Estrada ’19, Liam Albrittain ’19, Austin Anderson ’19, David Azzara ’19, Adrian Black ’19, Zeke Cohen ’19, Ross Hoch ’19, Jacob Kahrs ’19, Walker Knauss ’19, Mitchell Morris ’19, and co-captain John Spence ’19. The women graduate Klickstein ’19, Jesse Facey ’19, and Harris.